Port Angeles halibut fishing can be spectacular at times, just ask the locals who launch their boats at Ediz Hook year after year. 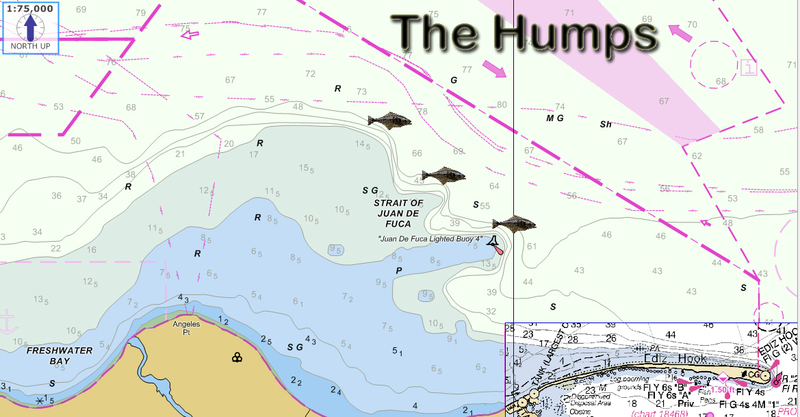 While some anglers aim for the rock pile farther out into the Strait or to Freshwater Bay, many anglers just head to “The Humps” an area not far from the end of the hook and easy to locate. The buoy can marks the first of the humps, the first and closest of the halibut spots to try. The second and third humps extend farther into the Strait. The third hump, in my opinion offers the best halibut fishing. Some of the locals will sit on anchor while others will drift. A few halibut anglers I know drop chum bags while on anchor and do extremely well on either tide. A close look at the map above shows the third hump and why it produces on either incoming or outgoing tide. The third hump might require a slightly different anchor position, during incoming or outgoing, depending on your exact location. It’s a big area though, and should provide ample opportunity to drop anchor to put your boat on a flat area or one with a gentle slope down current. If your boat sits over an upward slope it’s best to reposition. Remember, your scent field will travel farther on the flat or down slope than it will up slope. Best baits: Herring, Sardines, Mackerel, Squid, Salmon Bellies. When fishing bait I like to add a squid, as shown in the picture above. This rig is a gangion rig, which offers two hooks and doubles your chances while putting twice the scent into the water. If using J hooks be sure to jerk when you feel a bite. When using circle hooks adjust your drag to allow the fish to take a little line and then wait for the rod to load up (bend over) and line to start leaving the reel. Then slowly begin reeling the fish in. Tip: Don’t leave your bait or lure on bottom. After touching bottom raise it four feet off the bottom. This provides a better line of sight, sends your scent farther down current and forces the halibut off bottom to take your bait. When they move off the bottom to take your bait or lure they more aggressively attack and head back to the safety of the bottom. This provides better hook sets on J hooks and circle hooks turn aggressively into the corner of the halibut’s jaw, where you have the best chance of landing the fish. The image to the right shows a gangion rig, made from 500 pound monofilament line. You can also use “tuna cord” or commercial fishing white gangion line, available at LFS. The cord will typically be 350 pound test and easy to work with. I will post how to make a gangion rig with cord later this week, so stay tuned and subscribe to Halibut Chronicles to get all of my halibut maps, tips, tricks and photos. 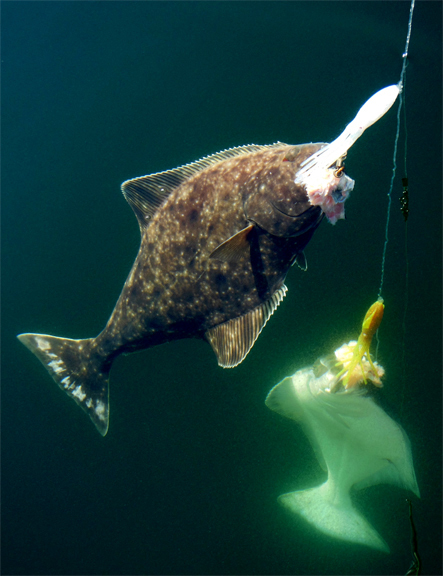 Note, two hook halibut rigs are legal in Washington, Oregon & Alaska. They are not legal in British Columbia. After fishing these rigs for more than 20 years I have noted that the majority of halibut take the top hook and occasionally you reel up two halibut at a time. 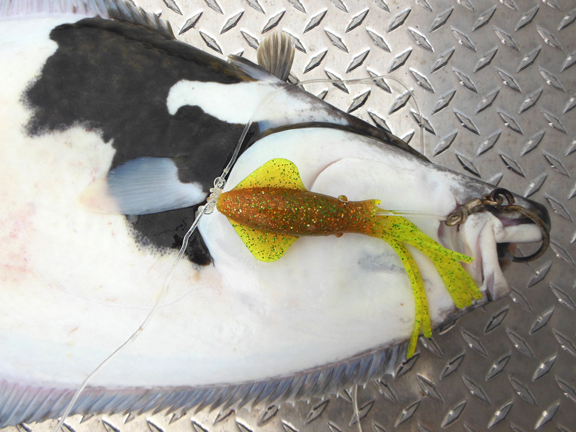 The top hook proves that having your bait or lure off the bottom increases your chances because of increased “line of sight” and a better scent field down current combined with more aggressive bites. This entry was posted in Anchoring for Halibut, Halibut Fishing Tackle, Halibut Fishing Tips, Washington Halibut Maps and tagged Gangion Rigs for Halibut, Halibut Fishing Maps, Halibut Lures, How to catch halibut in Port Angeles, Port Angeles Halibut Fishing Maps, Port Angeles Halibut Fishing Spots, Strait of Juan de Fuca halibut fishing maps, Washington Halibut Fishing Maps. Bookmark the permalink.